If you consider investing or you already are investing in cryptocurrencies then you know how hard it can be to stay up to date and keep track of the cryptocurrency rates at all times. Because of that, nowadays you can find many apps that can help you stay informed and get alerts for specific cryptocurrencies you are interested in. We searched among apps and we have for you one amazing cryptocurrency alert app to help you with that. Let’s see what this cryptocurrency app is all about. What is Crypto Alert all about? 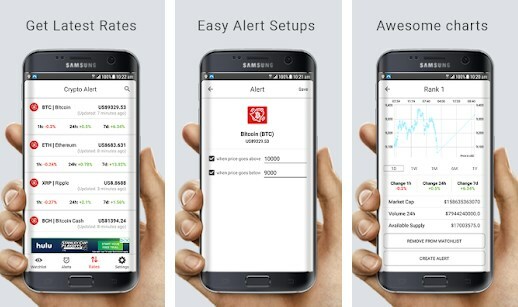 The Crypto Alert is one easy to use and highly efficient and practical cryptocurrency alert app that is offering users the simplest way for them to keep track with the cryptocurrency rates and stay up to date with the cryptocurrencies they are interested in. Developed for android users, this app offers various features that will help users get the latest cryptocurrency rates and get all information needed about cryptocurrencies they follow, getting cryptocurrency alerts about changes made instantly on their phones. This cryptocurrency alert app is offering all users different helpful and efficient features that will help them stay up to date and instantly track specific cryptocurrencies, getting alertef whenever there is a change. By using the app, each user has the chance to get the latest rates of cryptocurrencies and keep track with rates of specific cryptocurrencies he follows. The app is even offering the users easily alert setups which will allow the user to set alerts easily on his phone for any cryptocurrency he likes to. Awesome charts are offered as well so the user will easily digest them, getting the full details to understand each cryptocurrency without much effort. The simple alerts will be offered for the user directly on his phone’s dashboard instantly whenever a change is made and allow him to stay up to date with the cryptocurrency world. All of this available inside one app with instant alerts about the cryptocurrencies he follows, informing him about anything he needs to know about the cryptocurrencies. Download it now for free on Google Play to easily keep track of the latest cryptocurrency rates!